It was a bit of a rough start for Andrew Luck, as he struggled in the first quarter. There were some poor passes throughout, but he mostly righted the ship as the game wore on and he led his Colts to a comeback win. Luck had some beautiful back shoulder throws, especially up the seams. His offensive line settled down and kept him clean when it mattered most, as that’s where he really shined. T.Y. Hilton may not be 100% healthy, but he showed in this game that he’s still incredibly dangerous. His footwork on his 25-yard reception on the Colts’ first touchdown drive was absolutely remarkable. He also showed that there are not many defensive backs that are a speed match for him, as he blew past B.W. Webb for a 55-yard gain on a post route in the third quarter when the Colts were still down 10. The Colts’ defense did a superb job of swarming Giants running back Saquan Barkley. Whether it was runs or receptions, the Colts made sure multiple players were around him to prevent him from breaking off a big play. Denico Autry played a big role in bottling up the Giants’ rushing attack. He made a couple of stops in the backfield and forced Barkley to change his point of attack on a handful of plays. Autry was also solid as a pass-rusher. Eli Manning came out strong in the first quarter. He was efficient and unafraid to throw downfield, as evidenced by his 55-yard completion to Sterling Shepard. From there, however, the Giants seemed content to dink and dunk throughout the rest of the game. They were efficient with play-action throws but didn’t try to throw downfield much at all. The Giants were decent in pass protection but struggled with run blocking. Their offensive linemen and tight ends were constantly blown up at the point of attack, leaving Saquan Barkley with little room to run. The Giants can be happy that their run defense played so well, and that was led by Dalvin Tomlinson. He made multiple stops and was all over the place, forcing the Colts backs to find somewhere else to run. He was a big reason, as was the rest of the defensive line, that the Colts managed a measly 47 yards rushing on 14 carries. Olivier Vernon continued to be the best player on the Giants defense, as he was a bit of a nightmare for the Colts to block. He didn’t record a sack but was able to hit the quarterback and get a bunch of pressures as well. Indianapolis: Andrew Luck had some iffy throws early on, but he settled the ship and made some huge throws as the game went on and his connection with T.Y. Hilton was a huge reason that the Colts were able to complete the comeback victory. 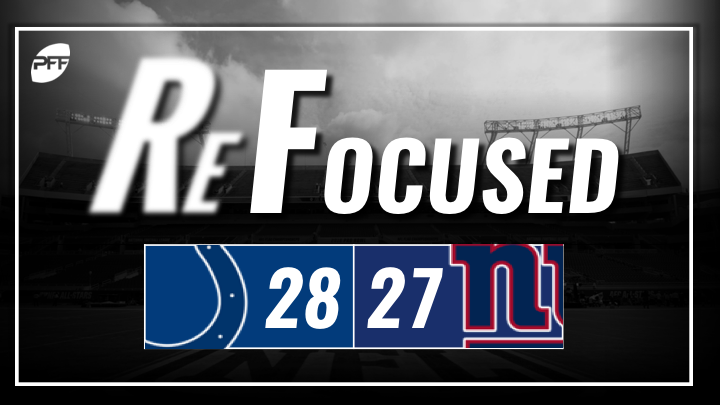 New York: The Colts did a great job of shutting down Saquon Barkley, and without him to lean on, the Giants were unable to maintain the lead.